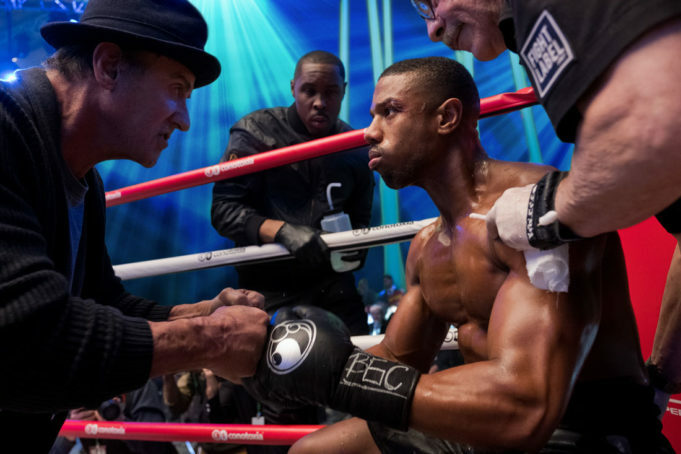 Sylvester Stallone stars as Rocky Balboa, Wood Harris as Tony ’Little Duke’ Burton, Michael B. Jordan as Adonis Creed and Jacob ’Stitch’ Duran as Stitch-Cutman, in CREED II, a Metro Goldwyn Mayer Pictures and Warner Bros. Pictures film. Boy Erased (R) The best movie yet to tackle gay conversion therapy, yet it feels oddly uninvolving. Based on Garrard Conley’s memoir about growing up in Arkansas during the ’00s, this drama stars Lucas Hedges as Conley’s fictional alter ego and Russell Crowe and Nicole Kidman as his religious parents who force him into therapy sessions. Joel Edgerton directs this and also portrays the pastor who runs the camp, and while he delves into the destructive methods that teach gay kids to hate both themselves and their parents, he doesn’t go far enough. He needed to portray the camp as a hellish place. The performances by the principals are faultless, but the whole thing can’t escape feeling by-the-numbers and dutiful. Also with Xavier Dolan, Joe Alwyn, Britton Sear, Madelyn Cline, and Troye Sivan. Burn the Stage: The Movie (NR) Park Jun-soo’s documentary follows the Korean boy band BTS on their worldwide concert tour. 55 Steps (PG-13) This drama based on real life stars Hilary Swank as a 1980s lawyer who takes on the case of a mental patient (Helena Bonham Carter) with implications for the whole mental health system. 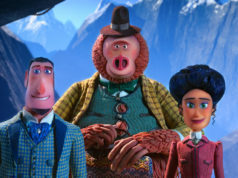 Also with Jeffrey Tambor, Michael Culkin, Richard Riddell, and Johan Heldenbergh. The Long Dumb Road (R) Jason Mantzoukas and Tony Revolori star in this comedy as two men taking a spur-of-the-moment road trip across the Southwest. Also with Taissa Farmiga, Ron Livingston, Casey Wilson, Grace Gummer, Lindsay Burdge, Will Brittain, and Pamela Reed. A Private War (R) Rosamund Pike needs to stop starring in dry, self-important movies about world events. This makes three this year after Beirut and 7 Days in Entebbe. Here, she plays Marie Colvin, the American journalist for the British newspaper The Guardian who was killed covering the civil war in Syria in 2012. Pike does give a fine performance as a war correspondent who’s drawn to the job because of the adrenaline rush of dodging bullets and risking her life. 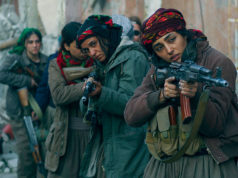 Yet documentarian Matthew Heineman (City of Ghosts, Cartel Land) making his first fiction film doesn’t bring sufficient invention to this story of a flawed heroine, and his focus on her psychology has the unfortunate effect of reducing all the Third World suffering to a mere backdrop. Also with Jamie Dornan, Tom Hollander, Greg Wise, Faye Marsay, and Stanley Tucci. Welcome Home (R) Aaron Paul and Emily Ratajkowski star in this thriller as an American couple vacationing in Italy when they are preyed upon by a helpful stranger in the countryside (Riccardo Scamarcio). The Ballad of Buster Scruggs (R) The Coen brothers’ latest Western is an anthology film of six stories set in the Old West. Starring Liam Neeson, James Franco, Zoe Kazan, Brendan Gleeson, Stephen Root, Ralph Ineson, Tyne Daly, Saul Rubinek, Clancy Brown, David Krumholtz, Tim Blake Nelson, and Tom Waits. The Great Buster (NR) Peter Bogdanovich’s documentary on the life and career of Buster Keaton. Also with Mel Brooks, Paul Dooley, Bill Hader, Bill Irwin, Carl Reiner, Cybill Shepherd, Ben Mankiewicz, Leonard Maltin, and Werner Herzog. Green Book (PG-13) Peter Farrelly’s dramedy based on a true story stars Viggo Mortensen as an Italian-American nightclub bouncer in 1962 who’s hired to chauffeur a black concert pianist (Mahershala Ali) through a concert tour of the Deep South. Also with Linda Cardellini, Don Stark, Sebastian Maniscalco, Jenna Laurenzo, Dimiter Marinov, Mike Hatton, and Iqbal Theba. Prospect (R) This science-fiction film stars Pedro Pascal and Sophie Thatcher as a father and teenage daughter who travel to a remote moon looking for jewels that will make them rich. Also with Jay Duplass, Andre Royo, Anwan Glover, and Sheila Vand. Speed Kills (R) John Travolta stars in this thriller as a boat racing champion who lands in trouble with the law and drug lords. Also with Jennifer Esposito, Katheryn Winnick, James Remar, Kellan Lutz, Tom Sizemore, Jordi Mollà, Amaury Nolasco, and Matthew Modine. Next articleThe Opposite of Schadenfreude?